In other words, we are using up nature’s concentrated stocks and sources of energy, raw materials and freshwater, even as we are filling up nature’s “sinks” with waste products. These overflowing sinks include air, land and water media, in the form of the atmosphere, terrain, lakes, water courses and the ocean. Just as a spendthrift can overdraw a bank account year after year – at least for a while – he or she does so only by drawing down their capital or principal. Similarly in the case of Planet Earth, industrial human civilization is rapidly drawing down “natural capital.” Earth Overshoot Day is the date in which our “spending” exceeds the growth from interest (“biocapacity”) in 2016. 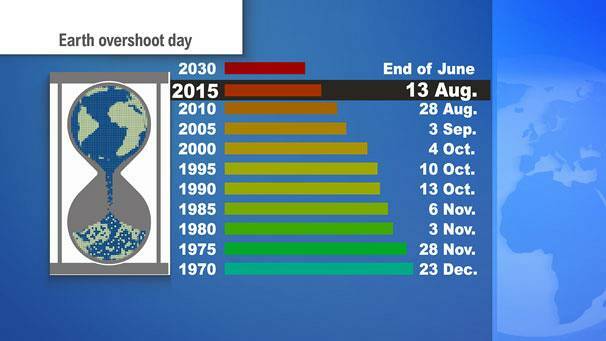 Arrival of Earth Overshoot Day from 1970 to 2015; it comes a bit earlier every year. 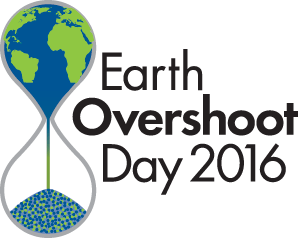 Earth Overshoot Day is hosted and calculated by GFN, an international think tank based in Oakland, California. GFN coordinates research, develops methodological standards and furnishes countries, their decision-makers and “global citizens” with a chest of tools to aid the human economy in operating within Earth’s ecological limits. As the 7.4-billion human population, to which are added 80 to 90 million more people every year, continues to overshoot the long-term carrying capacity of the planet by more and more, Earth Overshoot Day arrives a little earlier each year. 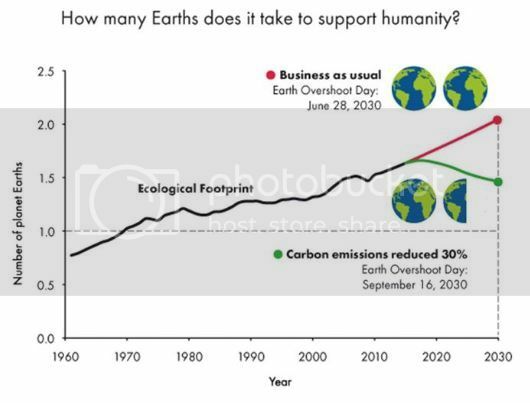 The diagrams below show that 55 years ago in 1961, before the human economy as a whole slipped into overshoot mode, and before our collective Ecological Footprint (EF) exceeded the planet’s biocapacity, the EF was 71 percent of biocapacity. We were still living within our ecological means. By 1985, humanity had crossed a dangerous threshold into overshoot mode – using 114 percent of annual biocapacity – and by 2012, this had ballooned to 156 percent. This means we were using the biocapacity of more than 1.5 Earths annually: an utterly unsustainable and untenable situation over the long run. The graph below illustrates the increasing size of humanity’s aggregate EF from 1960 to the present and projected to 2030 under business as usual, by which time it would theoretically take two Earths to support humanity. However, if carbon emissions could be slashed by 30 percent – through a combination of renewable energy sources (wind, solar, etc. ), energy conservation and efficiency, and population stabilization – then humanity would still be in overshoot, but at least headed back in the right direction and down toward safer territory. 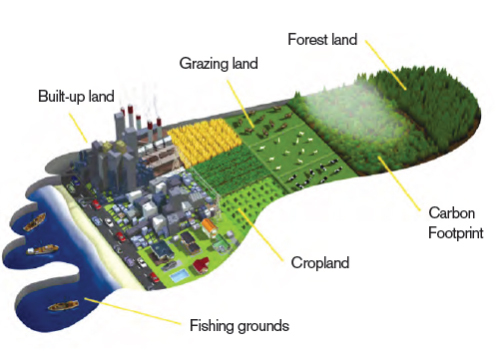 Our EF consists of uses of – and impacts on – all biologically and ecologically productive lands: forest land, the carbon footprint on that forest land, cropland, grazing land, fishing grounds and built-up land (which usurps biologically productive land by converting it into buildings and pavement). And what of the USA? 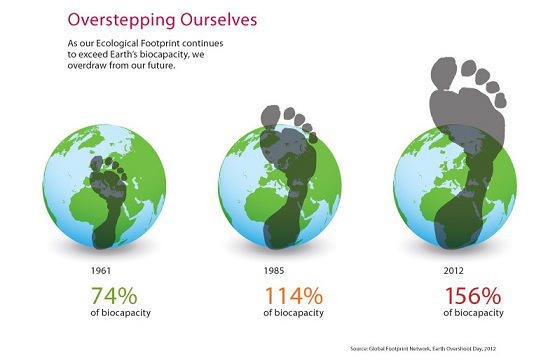 How large is our Ecological Footprint? Unfortunately we have been in the red for a long time. Already by 1961, the date for which the first EF calculations have been done, the United States was an ecological debtor nation. This graph tracks the per capita or per-person Ecological Footprint and biocapacity in the United States since 1961. Both are measured in units called global hectares. Biocapacity per capita varies yearly with ecosystem management, agricultural practices (such as fertilizer use and irrigation), ecosystem degradation, weather and population size. The EF per capita changes with consumption amounts and production efficiency. While most input data for the EF accounts are from United Nations sources, country data are of variable quality. The quality of the assessment is scored on a 1-6 scale; the USA, with a score of 6 on this scale, has high-quality environmental, agricultural and forestry data, as would be expected. Our per capita EF (the red line) has bumped up and down but not really increased in the past half-century. However, what has increased is our population – by more than 140 million since 1961. 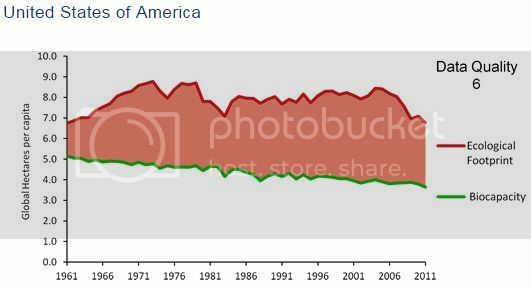 This is the main reason why our per capita biocapacity (the green line bordering the bottom of the red zone) has been trending steadily downward for more than half a century. There are number of things we as individuals and American society as a whole can do to reduce our own ecological footprints as individuals and as a country. Many of these will already be familiar to conservationists and schoolkids: conserving energy through a variety of means; transitioning ASAP from dirty, polluting fossil fuels to clean, greener energy sources; recycling materials and sipping rather than slurping water; and last but not least (but certainly the least known) – stabilizing our population (i.e., halting U.S. population growth). Individual Americans can choose to have two children, one child or none, thereby limiting their carbon legacy. But only the U.S. government can choose to reduce immigration levels, which are the main driving force behind our incessant population growth, which has been running from 27 million to 32 million per decade for many years, with no sign of relenting, due to lack of political will. What it boils down to is that unless Americans and citizens of the world can reign in population and consumption excesses, Earth Overshoot Day will continue to come earlier every year. We will continue to draw down natural capital and live in the red, until we have virtually bankrupted the biosphere. And there will be no rich benefactor to bail us out, nor a fresh new virgin planet to plunder. What will happen if we continue to ignore our excessive Ecological Footprint?